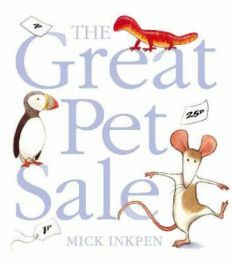 Any children’s book by Mick Inkpen, of Kipper fame, is likely to be a delight, and The Great Pet Sale is no exception. The cover shows a koala bear and an anteater looking very forlorn, but don’t miss the cheeky little rat standing on one leg in the bottom right-hand corner. We learn at the start of the story that everything in the pet shop is a bargain, even a little rat with half his whiskers missing, whose price tag is a mere 1p. A little boy with large spectacles is visiting the shop to see what he might buy as a pet, but the rat tries to waylay him and insist on being the best bet. Turning the page, we find the prices gradually increasing: a tiny terrapin for 2p, a turtle for 3p and a great big tortoise at 4p. In each case, attention is drawn to the numbers which are in a larger font. After this, we switch to animals beginning with the letter p (echoing the p for pence); at 5p each there is a pelican, a puffin, a penguin, a parrot and a platypus. The rat, of course, claims that p is of no interest, and what is desirable is R, ‘R for Ratty’! The next two pages show price increases once again, this time with a salamander at 6p, a skink at 7p, and a gecko at 8p. Since they are not individually labelled, the question is which is which? Rat predictably says, ‘Who cares?’ His feeling is that they are simply ‘sausages on legs’, which obviously would not merit consideration. Next we meet again, at 9p the pair, the koala and anteater from the front cover. This time, our little rat claims that no-one would want them because they are too fussy about their food: rat, on the other hand, eats anything, and to prove it the corner of that particular page appears to have been eaten. Moving on, there are assorted little brown creatures at 10p the lot, including a mouse, a bear and a rabbit. One would think that was an excellent bargain, but rat says these creatures are boring whereas he can stand on one leg. Finally, the boy comes to a large door behind which the rat claims lies a dragon. Do such things really exist? Why yes, it’s a komodo dragon, for just 25p. Rat seems a little crestfallen at this stage and doesn’t expect the boy to buy him. Having now seen all the pets on offer, the boy has to count his money and see what he can afford before he makes his choice. I won’t spoil the ending for you, except to say that there is a three-page open-out illustration showing all the animals, some riding on the komodo dragon’s back, others flying. There are so many children’s books these days that have charming illustrations, but this is up there with the best of them. It also has flaps to lift, which are always a success in allowing a young child to become involved and perhaps to guess or try to remember what lies beneath. The only problem is that in time they can tear if not handled very carefully. As well as being a delightful story, there is of course the added advantage of the inclusion here of simple numbers and small amounts of money that can be used for teaching children to count and perhaps try to do a little addition themselves. To add up the cost of all the pets, however, would be no mean feat and would require a little adult help. I have used The Great Pet Sale as the basis for a drama session quite successfully. Once the casting was complete, each child was given a piece of paper on which to write the price of the pet whose part they were acting – a useful activity for children aged between three and a half and four and a half. As there were only two speaking parts, we acted the story out three times so that six children had a chance to say a few lines. Animal characters always seem to be popular in stories or drama at this age. I definitely recommend this to parents, grandparents, teachers or childcare workers, for children aged two to five ideally. It would perhaps be a little difficult for young readers as there are some animals with tricky names. It’s discounted on Amazon if you feel that £6.99 is a lot to pay for a children’s book, even one as good as this. No Comments on "The Great Pet Sale"